The design service is part of Addvents commitment to providing electrical contractors with specialist ventilation product support. From detailed drawings supplied by the contractor, the Addvent team can develop a design scheme listing the equipment required for the project. The service applies to all schemes from residential to commercial and industrial projects. Selecting the right fan is important. Choose an Axial fan to move air over short distances or a Centrifugal fan for longer distances. Humidistat fans control the humidity in rooms where condensation is a problem. Where an older property is being refurbished, different challenges exist. Generally larger rooms with high ceilings and poor insulation means the effects of condensation are often more obvious. For these properties a more appropriate method of fan selection can be to multiply the volume of the room (V) by the appropriate air change rate per hour (ach). Example: For example a kitchen 3m long x 3m wide x 2.5m high has a volume of 22.5m³ and requires 10 air changes: 22.5 x 10 = 225m³/hour. A suitable fan would be an AVX150MP – with an airflow of 248m3/hour. Do not install extract fans in rooms where open flued appliances are sited. Ventilation products should always be installed by competent electrician. With the 2010 changes to the Building Regulations, as well as minimum airflow requirements (Approved Document F) minimum energy efficiencies are now required (Approved Document L). Addvent offers a complete product range designed to comply with the requirements. The new regulations require a minimum specific fan power (SFP) as minimum energy efficiency. This is measured in watts per litre per second (W/l/s) of airflow extracted and all models in the new range comply. The table below shows the minimum specific fan powers required to comply with the new building regulations. Mechanical ventilation systems should be designed to minimise electric fan power. 1.5 Watts per litres per second for continuous supply and extract with heat recovery ventilation systems. Intermittent Mechanical extract ventilation systems should be operated by local manual switches or automatically by a presence sensor. All other mechanical ventilation systems should have manual or automatic control of the boost facility. The new regulations require the installer to sign off the installation including airflow measurements. These Addvent fans are designed to comply with the installation requirements as set out in the domestic Ventilation Guide as part of Approved Document F. When installing there are a few simple rules that will help ensure compliance with installation and commissioning requirements in the 2010 Part F and the 2010 Part L of the Building Regulations for England and Wales. Rectangular or circular rigid duct should be used wherever possible; if necessary, flexible ducts maybe used, but should be kept to a minimum, connecting to rigid ductwork as soon as practicable. A maximum length of 1.5m of flexible ductwork is permitted when connecting to axial fans; for centrifugal fans this limit is 6 metres (for extract rates of 6-30 l/s) and 3 meters (for extract rates of 31-60 l/s). Two bends may be incorporated in a system up to 30l/s, reducing to one bend for extract rates above 30l/s. The inner radius of any bend must be greater, or equal to the diameter of the ducting used to keep resistance low. Flexible ducting must be pulled taught to minimise resistance, this is considered to be achieved if extended at least 90% of the total duct length. Ductwork should be insulated where it passes through unheated areas and voids. Horizontal Ducting, including ducting in walls, should be installed with a slight downward slope away from the fan to prevent moisture backflow. Flexible ducting must be installed without peaks or troughs. Vertical ducting requires a condensate trap in order to prevent moisture backflow into the product. Addvent is so confident in the quality of its installed products that they carry an exceptional five-year, no quibble exchange warranty. Some domestic, commercial and industrial ventilation products carry a 2-year exchange warranty and some air conditioning products a one-year exchange warranty. 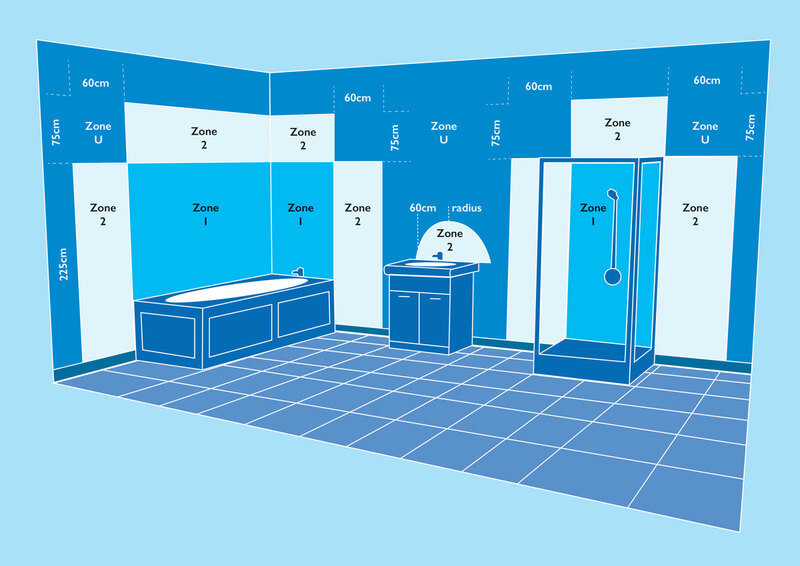 Bathroom zones are identified from 0 to 2, with 0 being the wettest, the former Zone 3 is now undefined. Any electrical item approved for use in a zone may be used in another zone with a higher number, but not in a lower number zone. Zone 0 The interior of the bath or shower which can hold water. Requires Low-voltage (max 12V) electrical products and to be IPX7 (the mechanical protection is unimportant). Zone 1 The area directly above zone 0 is limited vertically to 2.25m above the bottom of the bath or shower. Requires electrical products to be IPX4 or better, or SELV with the transformer located beyond Zone 2. If the fitting is 240v, a 30mA RCD must protect the circuit. Zone 2 If the fitting is 240v, a 30mA RCD must protect the circuit. Zone 2 The area beyond zones 0 and 1, 0.6m horizontally and up to 2.25m vertically. Zone 2 also includes any window with a sill next to the bath. Requires electrical products to be IPX4 or better, or SELV with the transformer located beyond Zone 2. Unzoned The area beyond Zone 2, previously referred to as Zone 3, is now undefined. Where previously Addvent products were shown as suitable for Zone 3 they now display this Unzoned badge. 3m Beyond Zone 1 When a bathroom extends 3 metres beyond zone 1, portable equipment is permitted. Any socket used for this portable equipment must be protected by a 30mA RCD. Under NICEIC Wiring Regulations bathrooms represent an increased electrical hazard. The 17th Edition regulations make some changes regarding technical alignment with European Harmonisation Documents, as well as additional definitions and requirements. A significant change is that 30mA RCD protected socket outlets are now permitted beyond a distance of 3m from Zone 1. They remain prohibited within 3m of Zone 1. There are some changes to the defined zones in the bathroom. Zones 1 and 2 remain. but Zone 3 is no longer defined (see the amended typical bathroom illustration above). The regulations continue to demand a minimum of IPX4 in Zones 1 and 2. Addvent offers a range of IP24-rated fans which meet these regulations and also offer a range of IP44 Low-voltage fans – recommended for added safety. Protective Extra-Low-voltage (PELV) – the item uses Low-voltage but it is connected to earth. Safety Extra-Low-voltage (SELV) – also a low-voltage system but with the output isolated from the input. All Addvent low-voltage products are classed SELV. Electrical equipment may be identified as having a certain level of mechanical and moisture protection. This is called Ingress Protection and is quoted as an IP number - such as IPXY, where X and Y are numbers. X indicates the level of mechanical protection and Y the level of moisture protection. In both cases, the higher the number, the better the protection. If an item of electrical equipment is not IP rated, it must not be used in zones 0, 1 or 2 (or elsewhere in a wet/damp environment). Typical electrical items which are marked with IP numbers include: extractor fans, lighting, heaters, shower pumps, electric showers. Shaver power points are not IP rated. If they comply with BS EN 60742 they may be located in Zone 2 (or beyond) providing they are unlikely to be subject to direct spray from a shower. Standard fittings – such as wall sockets, flexible cord outlets and fused switches – are not IP rated so must not be installed within zones 0, 1 or 2. Although 30mA RCD protected socket outlets are now permitted beyond a distance of 3m from Zone 1. Figures shown are recommendations. Where an X appears in this catalogue, the product has not been tested. The ‘BEAB Approved’ mark is an electrical safety mark whose scope covers electrical products for domestic and small office use. It demonstrates that the UK’s leading, independent approvals specialists have evaluated a product to the highest European and International standards and that a product meets the essential requirements of the relevant EU Directives. The CE mark is the manufacturer’s declaration to appropriate enforcement authorities that the product complies with all relevant European Directives, such as the Low-voltage Directive for Safety (73/23/EEC, amended by 93/96/EEC) and the Electromagnetic Compatibility Directive for Radio Interference (89/336/EEC, amended by 92/31/EEC), see below. Addvent products comply with European Directives and carry the CE mark. With increasing levels of electrical equipment comes the need to limit interference. The Electromagnetic Compatibility (EMC) Directive 89/336/EEC, as amended by 91/31/EEC and 93/68/EEC, set standards for interference levels: products must be constructed so that they do not cause excessive electromagnetic interference and are not unduly affected by electromagnetic interference. Most electrical and electronic products marketed in the European Economic Area must comply with the EMC Directive. Where Addvent products have been tested and conform to these regulations, this is indicated by the symbol shown opposite. RoHS – Restriction of Hazardous Substances, Directive 2002/95/EC – restricts the use of specific hazardous materials found in electrical and electronic products. All applicable products in the EU market after July 1, 2006 must pass RoHS compliance. The substances banned under RoHS are lead (Pb), mercury (Hg), cadmium (Cd), hexavalent chromium (CrVI), polybrominated biphenyls (PBB) and polybrominated diphenyl ethers (PBDE). Addvent fully conforms to Waste Electrical & Electronic Equipment Regulations which came into full effect on 1 July 2007. If you are in any doubt about the safe disposal of WEEE products, please contact us for advice on 0117 923 5375 or fax our technical team on 0117 923 5374.